My son “graduates” preschool this week. Which means at the end of this summer he enters Kindergarten. The Big Leagues. As parents, we spend a lot of time making sure our little ones are ready for Kindergarten. We try to prepare them academically, we buy them first backpacks and school supplies, and we worry about their capacity to sit still. Many of us send our kids to preschool hoping they’ll acquire the skills they’ll need to take those first steps into Kindergarten. But what do we do to prepare ourselves for this transition? Was preschool preparing us – or was it setting us up for failure and disappointment? When I walk my kids into preschool, I can often grab the teacher and talk to them really quickly. I can let them know if Cole or Evie have anything abnormal going on which might affect their day. I can mention if they have had nightmares, are going through “a phase” or didn’t eat a lot of breakfast. There’s a window of time for pickup and drop off so I have some flexibility if I’m running a few minutes ahead or behind. When I pick the kids up, I stay on the playground for a few minutes letting the baby join in the fun playing with the big kids. Standing around, I have more time to shoot the breeze with Cole’s teacher. I generally don’t even really talk about Cole, but I could. But Kindergarten is a different story. Promptly at 8:00 (or whatever time your school starts) the students line up and file into the class. I may see the teacher in passing and offer a smile or a wave, but there certainly isn’t a chance for me to have a quick chat – not with 20 other parents doing the same thing on the same tight timeline. When class is over, the students file out and we’re expected to leave. There’s no casual time to check in with teachers about the day and get feedback. And if you’re not ready for this stark change, it can feel like you’re getting snubbed. You’re not. Welcome to Kindergarten folks. Today I was shopping at Costco with the baby and had a little alert pop up on my phone. I smiled as I pulled out my phone and saw a picture of Evie dancing the merengue with one of her teachers. 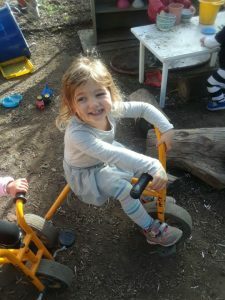 These updates aren’t uncommon in many preschools, and as parents we’ve come to rely on them as a near constant window into our kids’ world when they’re away. Pictures, videos, “urgent” alerts of a slightly scraped knee involving a few tears that were easily remedied with a Band-Aid are the norm for us. We don’t miss a thing and we love it. In Kindergarten? You can find out about your kid’s day from your kid when you pick them up. Unless your kid throws up on the floor. Then you’ll be alerted immediately. Basically anytime I want I can send an email to my kids teachers – or even the director of the school – and expect a response. I can schedule a quick chat if I have concerns or even just questions. I can check in with Cole’s progress or let Evie’s teacher know what we’ve been working on at home so she can help reinforce it. Sometimes it can feel like we’re a team, rather than a traditional parent/teacher relationship. Which is more like what you get in Kindergarten. You’ve got your scheduled events like Back to School Night and Open House and maybe a parent teacher conference or two. Outside of these four sanctioned opportunities to get feedback, you may experience a bit of a drought. Rest assured that if something were really important, they’d inform you. But the simple “Cole is doing great!” may not come as often as you’d like. Once upon a time, Kindergarten was about shapes and counting and coloring. In fact, your kids’ preschool may look a lot like what you remember Kindergarten to be like. So you may be picturing something similar next year. But when we say academics, we mean some legit academics. Including homework. If no one mentioned this to you, consider this your public service announcement! All the academics isn’t necessarily a bad thing! By the end of the year your child will likely be able to read to themselves – and, bonus points for me, to their siblings! So don’t be overwhelmed by the idea of all the academics, but do prepare yourselves for it to be a thing. When my kids went off to preschool, there were a few tears on the first day. We had talked about how much they’d love school, how they’d make friends, and how they’d get used to not being with Mommy all day, every day. And they did. But guess what? I didn’t really have to do the same thing. Remember that whole “Constant Feedback” thing I talked about? Well, thanks to that, we still get to see snippets of our kids lives while they’re away. And on days we don’t get those updates? We’re likely no farther than an arms reach away of thousands of pictures of our kids if we need a fix. So we often don’t realize that while we have concern for the way our kids are going to adjust to a full day without us, we haven’t really gotten used to the idea of a full day without them. Until now. Now we get a glimpse of what our kids experienced when they had to adjust to the day without us as we start to miss seeing those faces midday. Some of us are transitioning from two or three day programs to five days a week. Or longer hours. And for some of us, it may be the first time that we’re really separated from the kids. But, good news for those of us that may have a hard time adjusting – no one’s taking away your phone, so feel free to self-soothe as needed! Many preschool experiences leave us feeling like we are the ones in charge. We decide on the school, we can choose the teacher, and we can even pick a school that works with our unique work and life schedules. But once elementary school starts, it is the school’s way or the highway. Unless you decide to go private, you’ll be looking at a typical 8-2:30 schedule, often at the school that happens to be closest and with the teacher the school’s random assignment provides you. You can- and should!- still advocate for your child if you find that something isn’t going well. But where you were once the decision maker, you might find that you are now more of a contributor or advisor. It may take some time to get used to your new role, but once you do, we think you’ll find some peace in not having to make all the big decisions, ALL the time. Depending on where you chose to send your child to preschool, you likely chose an environment that was understanding of how your life works, whether that was a full-time career or the kind of situation where you pick your child up late every Tuesday. Whatever you settled on, it was likely designed for parents like you. You may find that this is not the case at the elementary school level. Where the Winter Performance was once held at 6 pm on a Friday, it may now be placed at 10 am on a Thursday. Some things you’ll be able to accommodate, but it’s better to remind yourself now that you don’t have to go to all the things ALL of the time. And make sure another Mama catches a cell phone video she can send you afterwards! Don’t be! Kindergarten is still a summer away and you have plenty of time to adjust to the new normal. We love you, and we know you’re going to do so well in Kindergarten – er, as a Kindergarten parent. I felt like I had to prepare just to get used to preschool! I can only imagine kindergarten prep. I got a couple years though ? Oh my gosh, It’s crazy how different it will be. I’m going to need all the help I can get! All of these are so true! 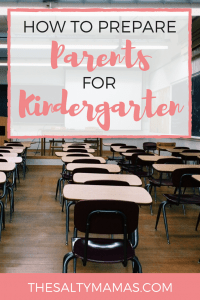 Kindergarten is a huge step to prepare for! Great tips!